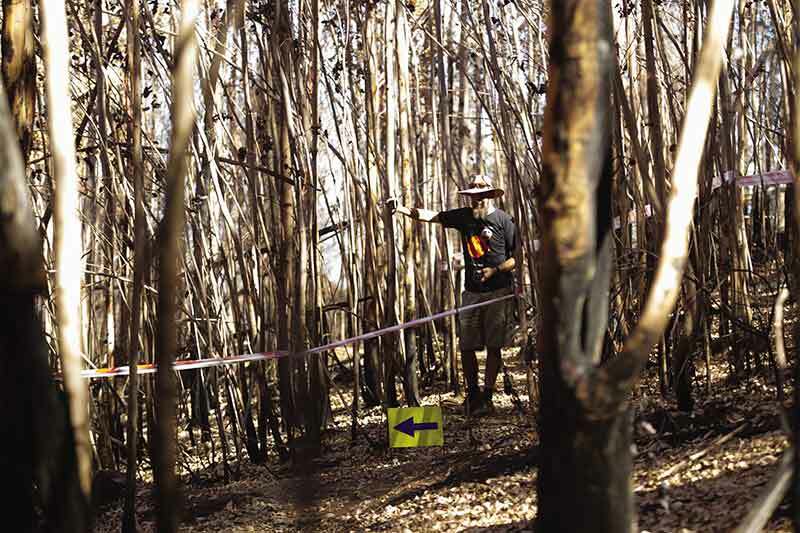 In February Erik Kleinhans took part in the inaugural Fairtree Capital Simonsberg Contour which was dubbed the #FireRide after the devastating Simonsberg fire which decimated the trails just a week before the event. The Simonsberg Mountain is my favourite around Stellenbosch. When you look at it on certain times of the day, it seems like this big flat screen billboard of nature. While hiking up Stellenbosch Mountain you get an incredible birds-eye view of our majestic friend and if you ride up Simonsberg to Kanonkop, you will be spoilt with views over vineyards for days, Table Mountain and the ocean in the distance. The Simonsberg Fire was yet another of so many wildfires that has ravaged the Western Cape over the last few years. It was yet another sad occasion. In the fifteen years I’ve been living in the Boland, I cannot remember that these wildfires happened so often as the last two or three years. It breaks my heart. It is truly terrible; the loss of animal life, endangered animal habitat, homes, farms, livelihood and (hopefully not) lives of people, and the scarring to our beautiful nature. The damage to a bicycle race seems so small in the bigger scheme of things, but still, thousands of Rands and work goes into preparing trails and it is also someone’s form of income. After a short test ride with the organizers of the Fairtree Capital Simonsberg Contour stage race, I could not believe that in only a week after the fire, they could get the trails in such rideable conditions. I guess it does help to have passionate event sponsors who invested heavily to get the trails ready with more than fifty people working on the trails leading up to the event. Delvera, looking over the winelands from the cool comfort of a big shed, makes for a good venue for an event of this size which was just over four hundred participants, I’m sure they can pack in a few hundred more. But for now, it made the queues slightly shorter for the lovely beer on tap, lunch, breakfast, coffee and registration, naturally, with some wine in the goodie bag! Meurant Botha overseeing the route he saved. The routes were supposed to be king a few weeks ago, before the fire blackened most of the Simonsberg and I was amazed that they did not get far off that goal being able to still ride on most of the trails. It made for interesting riding and views through the burnt plains and forests with only the trails raked clean in a natural brown. Some of the trails clearly got handed a bit more heat and became quite sandy, but I’m looking forward to riding them after some rain in the winter. With so many races on the SA calendar, you would wonder how we can fit in more. But when events get the recipe right with fun, rideable routes, great scenery and that personal, sociable touch thanks (in no small part thanks to sponsors new to the sport of mountain biking) there always seems to be more room. And I have a feeling the investment guru’s of Fairtree Capital and Meruant Botha’s team have more tricks up their sleeves for next year!